Glass and Stainless Limited was born from a desire to combine extensive technical knowledge, high quality service with a premium quality product. Focused on optimised delivery and service we really do lead the market. Due to the expertise of our team we only specify the highest quality products to the most stringent safety regulations looking at each project individually. We listen to the demands of our clients and adapt to suit your project ensuring we advise the right products for you! All glass and stainless steel products supplied comply with current regulations. Glass and stainless Ltd believes that a quick and accurate response to all enquiries is vital. All quotes clearly show costs, anticipated delivery dates and the products / descriptions of what has been quoted for. We pride ourselves on our ability to design, develop and deliver the requirements of your project within the timescale and budget you set. With an emphasis on safety, innovation and cost effectiveness, we always strive to deliver on time and within budget. Glass and Stainless Limited also offer a full supply and fit service, using Architectural Engineers with over 40 years’ experience, we together can develop your ideas into reality. Based in Congleton, Cheshire we offer bespoke glass and stainless architectural installations in Cheshire and throughout the UK. G&S supplied the glass and clamps my staircase and I am very impressed with the final result.I would like to thank you and your company for the service and excellent job you did and will be sure to recommend you to my friends who I am sure will be equally impressed with my new hallway.thanks for a brilliant job. Paying over the phone was simple when I decided to order. The glass was delivered within the times given and was of excellent quality, now it fitted it looks great. 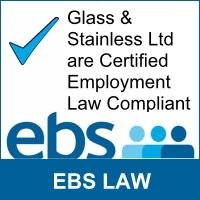 A big thank you to the Glass & Stainless team. Many thanks for all your help over the last few days in trying to schedule the delivery for a convenient slot. All glass received ok this morning, and your delivery driver was extremely helpful. All in all, an excellent service from initial quote to delivery. All arrived on time with a helpful driver, really pleased with the service I have received from Glass & Stainless Ltd. A great product at a great price. I would have no hesitation in recommending you as you have exceeded my expectations (which are quite high!). I have fitted the post and clamps system you recommended and I am really happy with the quality of the product, thank you for a great service. We just wanted you to know the glass fitting went well and looks amazing. It certainly has the wow factor with views over the cottages in the village. Many thanks once again for all your assistance. We would have no hesitation in recommending you. My glass and components arrived in good condition and time. Thank you and your team for the excellent service. Thank you to the Glass & Stainless team, I requested a call from the driver delivering the glass 30 mins before been on site to which he did. Thanks very much for everything…. Great service. Hope it fits now! I am very pleased to be able to say that the whole process of buying our glass and clamps was a very pleasant experience. My enquiries were dealt with promptly and professionally by very friendly and helpful staff. I would rate each of the categories as 10 and would be very happy to recommend Glass and Stainless to anybody. Just a quick note to say thanks for your great service with the glass I ordered. This was for myself but as a builder I sometimes need glass and won’t hesitate to use you again. Has your balustrade been tested to BS 6399-1: 1996 ‘Loadings for buildings’? Does your glass partitioning system comply with BS ISO 11600? At Glass and Stainless we take safety very seriously, we constantly monitor all our suppliers to ensure we supply systems which meet and sometimes exceed the current british safety standards. We aim to provide the highest quality products within the marketplace. To ensure this, all the fittings we supply are manufactured and inspected to meet your high standards. All of our suppliers have achieved a minimum of BS EN ISO9001: 2008 accreditation ensuring you benefit from exceptional product quality. This accreditation guarantees that we conform to stringent quality control procedures. Ensuring we get it right first time, every time – so you will too. We constantly monitor the market conditions to ensure a fair pricing structure throughout. Our quotations are simple to read with all items clearly itemised, we use plain English terms for our products and are always more than happy to take the time to explain what is on the quotation and why. Where possible all our systems are sourced from UK warehouse, we have a vast stock range at our disposal. We understand the demands placed on installer’s in the current market, this is why aim to ship most products on a next day delivery service, whether that be at your place of work or on site, we work hard to make this as stress free as possible for you. Even Saturday deliveries can be arranged at an additional cost.